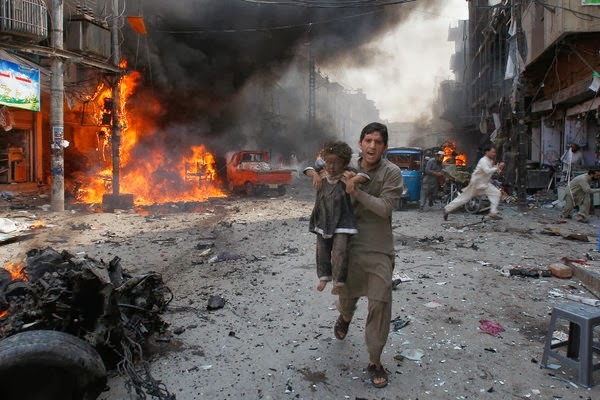 Islam Around Us: Bomb Kills Dozens at Market in Northwestern Pakistan. Bomb Kills Dozens at Market in Northwestern Pakistan. on Sunday in Peshawar, Pakistan. PESHAWAR | Pakistan | 29 Sep 2013 :: A powerful car bomb ripped through a busy marketplace in Peshawar, the regional capital of northwestern Pakistan, early Sunday, killing at least 38 people in the third major attack in and around the city in the past week.The explosion occurred in the historic Qissa Khwani bazaar in the old quarter of the city, roughly two miles from the site of a double suicide bombing of a Christian church a week earlier that killed dozens of people. Experts said the blast was caused by homemade explosives and artillery shells that had been hidden in a parked car. The dead included 14 members of one family who had come to Peshawar from a nearby village to distribute wedding invitations. Rescue workers cut through the smoldering wreckage of burning vehicles and destroyed buildings in an effort to find survivors. Television stations carried graphic images of the carnage, which underscored to Pakistanis across the country the continuing threat from the Taliban and allied militant groups. The attack came after a particularly bad week across Pakistan. An earthquake killed at least 300 people in a remote part of Baluchistan, the country’s largest but least populous province, and three major militant attacks in Peshawar killed at least 140 people. Last Sunday, the suicide attack on the nearby All Saints Church killed 85 people, and a bombing on a crowded bus on Friday killed 21 government employees as they traveled home for the weekend. The attack on Sunday took place in the Qissa Khawani, or storytellers’ bazaar, which takes its name from ancient times when merchants and travelers from Central Asia stopped there to rest and share their stories. Some of the tea stalls from that time still exist. Police officials said at least 440 pounds of explosives was used to make the bomb, which left a crater that was three feet deep. The explosion blew up storefronts, some of which caught fire, destroyed at least three shops and damaged dozens more. Traders announced three days of mourning. The violence also came at a time of intense political debate over whether the government should hold peace talks with Taliban insurgents in a bid to end the bloodshed.